I had just enough good leaves on my basil plant to bring you this home-grown basil pesto. Which I put on pasta, because I can’t help myself. I have a teeny tiny four-plant garden in pots on our back deck: basil, mint, oregano, and a jalapeno (follow me on Instagram for gardening updates!) I’m expanding cautiously; I like the idea of growing my own food but I quickly ditch the idea whenever it gets to hot or too buggy. Two of the plants are actually survivors of last summer’s experiment, in which I merrily stopped watering the plants once it got to July. I was shocked when I examined the pots this spring and found teeny remnants in the mint and oregano pots; I was even more shocked when they started growing, once the watering started back up. Next year I plan to start my jalapeno earlier so the peppers are ready at the height of avocado season! When we own a house I think I’d like an avocado tree…anyway. For now I have a dying basil plant (it did great up to about 90 degrees, but now that temps are in the high 90s all day, it’s wilting like a debutante in he heat). Nevertheless, it makes a great pesto. You can actually make pesto out of pretty much any sort of green + nuts + olive oil + garlic + cheese. Arugula pesto is common, and I recently learned that you can make pesto out of the leafy tops of carrots. I used toasted pine nuts and raw garlic in mine; the secret ingredient is a quick squeeze of lemon. It’s not enough to make the pesto taste like lemon, but the acid wakes the whole bowl up, bright and beautiful. I tossed my pesto with browned chicken pieces and al dente pasta, but you can also eat it on bread, or serve it as a dipping sauce. It freezes well, too (though the cheese component doesn’t, so if you plan to freeze, add the cheese in after the pesto’s been thawed). Variation! If you like nutty flavors, up the nuttiness by roasting your garlic. 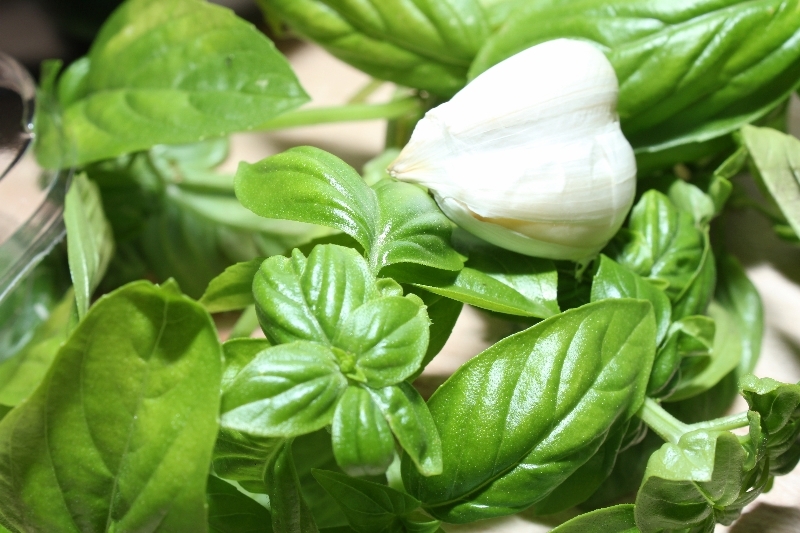 To do this, cut the stem ends off of the garlic–you can do this with cloves or a whole bulb. Drizzle garlic in olive oil, wrap with foil, and bake for 30-45 minutes (depending on how large your garlic package is). When it’s cool, just squeeze the garlic out of the cloves. For roasted garlic pesto, double the garlic. 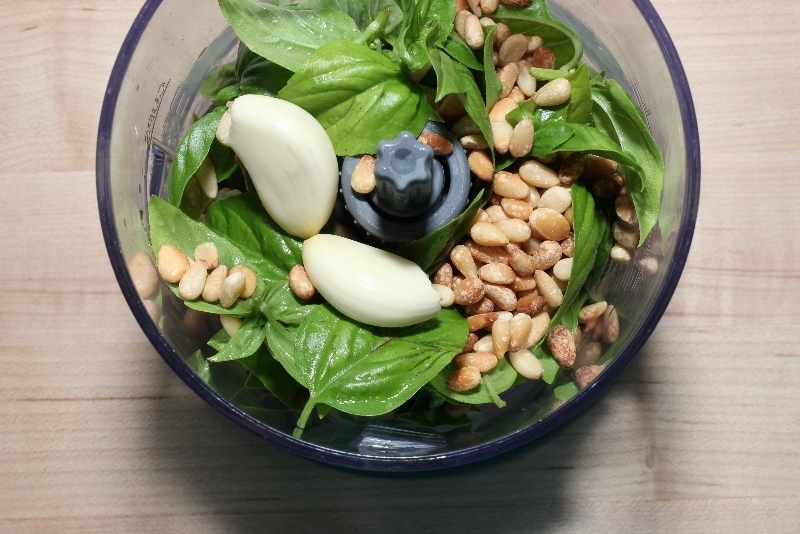 Combine basil, garlic, pine nuts, and olive oil in a food processor and blend until smooth. Stir in salt and pepper and cheese, adjusting to your liking. Finish with in a very little bit of fresh lemon juice. Boil a large pot of water. Cook pasta according to package directions. Drain and set aside. Heat oil over medium-high heat. Season chicken with salt and pepper and cook, turning until pieces have nice color on all sides. 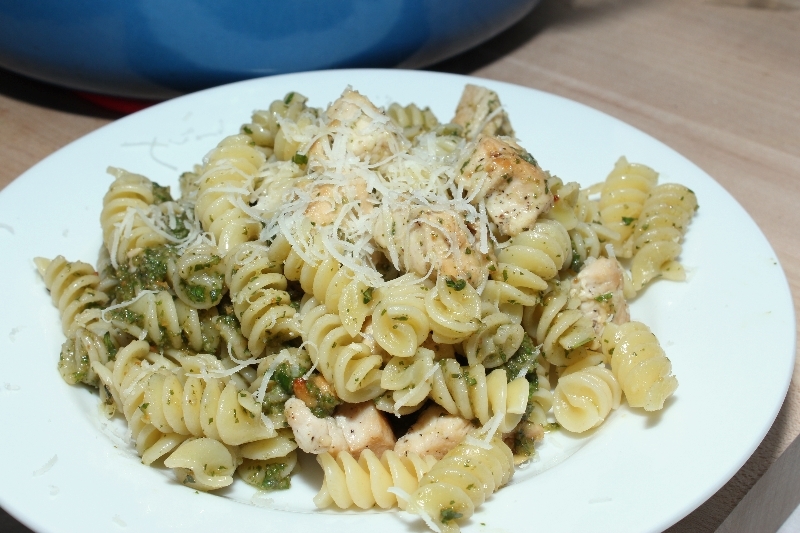 Toss chicken with pasta, pesto, and extra cheese. Enjoy!